- find logical and melodic patterns within the inversions and "play with feel"
- use them in context with affiliated chords. In the case of m7b5, Ted says "I like them on #4 going to I" (14:25 - 17:00) .... and then plays a few cool examples which I couldn't transcribe. Anyone know how this progression looks like? Based on your diagrams, I think the fourth one on the top line is not correct. The note on the 2nd string should be up one fret (otherwise you have a major and a min 3rd). Also, normally I think one normally includes a 7 with the slash through the circle for half-diminished 7th. I'm not sure if that symbol alone is implied and understood to be m7b5. Also, the Bb9 (fourth chord on the bottom row) is Bb/9 or Bbadd9. The way it's written now means dominant 9th, but there's no b7 present. For the Csus, I think Ted would have named this C11. Sorry I didn't mention this, but the Bmb5 in the bottom row....should be Bdiminished. Minor with a b5....yep, that's diminished (not dim.7), and not minor b5....although that sound like a logical name! Hi - thanks a lot of your help. I appreciate it very much! So the last two chord are the m7b5 (#4) going to the 5 of 1? This progression is in the key of Bb? Correct? Oh man!! I'm so sorry! I was working from a different part of the tape..!! What an idiot! 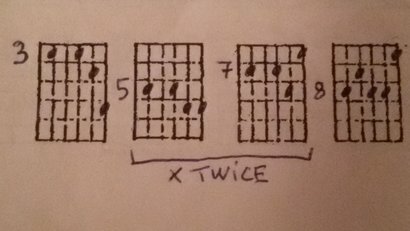 Anyway here's the bit you're referring to, I did two alternate fingerings (from the tone I reckon Ted's playing the top ones, but the bottom row is on the upper string set if you prefer playing it there). The last two chords are alternatives to the #iv and V, that he plays immediately after the sequence. I think these are V4 voicings? Bottom and top sets. Anyway I've learned something from doing this, so was definitely worth doing! Exactly! You nailed it thanks! The chord name in question should be Dm7b13. To be sure about stuff like that, you just have to think about which notes are in the scale. Since we are in the key of Bb the appropriate scale would be D phrygian (Bb major scale played from d to d). That is d-eb-f-g-a-bb-c. As you can see the scale contains the regular 5th and the flat 13th. So the name should be Dm7b13. And who would talk about a# when playing in Bb?? You are theoretically correct about the minor 7b13. However, Ted often called this chord m7+5. I guess that both ways could be considered acceptable, unless one is thinking strictly diatonic, then as you stated, an A# in the key of Bb seems odd. As Paul said, Ted would likely name this chord Dm7+. Why? The most important decision in naming a chord is determining how it functions in context, what job it is doing in the progression. In this case, it really does make sense to think of it as a iii chord in between a ii and a IV chord. So we do want D to be our root. Now to determine the name of the chord tones, we consider the D major scale. It's true that the chord progression as a whole is in Bb major. But for the purpose of naming chord tones, we want to refer to the major scale of the chord's root: D.
The chord tones from the bass up are D, C, F, and Bb or A#. That's root, b7, b3, and either b13 or #5, respectively. To decide between calling it the b13 or the #5, we notice that we want some kind of root, third, fifth, seventh in the chord if we can get it. That's just the way chords are usually built: in thirds from the bottom up. In this case, we don't have a flat fifth or a natural fifth but we do have a serviceable sharp fifth. Therefore, we name the chord m7#5. But Ted preferred the "+" symbol to "#5" so in Ted naming it's Dm7+. AsatB, Paul & James thanks a lot - Makes it v.clear! I've changed the chord name to Dm7+ in line with Ted's preferences... thanks once again!! Love this forum! "The most important decision in naming a chord is determining how it functions in context, what job it is doing in the progression." Can you give an example when a D-minor chord functions as a m7#5 and when it functions as a m7b13? When I'm talking about chord function, I'm talking about figuring out the best and most appropriate roman numeral for the chord. That's the idea of functional harmony. Picking the best roman numeral, which is equivalent to picking the best root, is what I'm saying is the most important decision in naming a chord. When you're talking about #5 versus b13, that's different than roman numeral chord function. It's certainly a valid question, just different from chord function. In common practice classical music, the #5 is a tendency tone and likes to resolve upward by step. The b6 or b13 would resolve downward by step. In jazz, these tones don't necessarily have strict resolutions. They're more like colors or tensions that don't have to follow classical voice leading procedures. So in jazz, #5 doesn't have to move up by step and b13 doesn't have to move down by step. Ted had his own chord naming conventions which are pretty logical. Generally, he wouldn't use 13 in a chord name unless there was a 9 in the chord. Since this chord doesn't have a 9 in it, he likely wouldn't call it a m7b13. Once in a very rare while, he named chords with b6 (flat sixth) rather than + (for sharp fifth). For example, on his worksheet listing homonyms for all 43 four note chord types, for chord #23 containing the notes C, Db, G, A, one of the very obscure homonyms he lists is: F9b6 no R, no b7. In this extremely unusual chord name he used flat 6 because there is already a fifth (the C natural) and there is no flat 7. But I don't recall ever seeing him write m7b6. And I've looked through a lot of his papers. There are quite a few instances, however, of him writing m7+ in his books and on his handout sheets. As I said, the logic is probably building chords up in thirds so they have a root, 3rd, 5th, 7th, etc. if possible.